Need to know how to make a drum kit quieter? Want to practice drums in an apartment without the neighbours wanting to kill you? This is the page for you, with the best tips to reduce drum volume. Whether you need to practice drums quietly in a house, an apartment, or your dorm room, we’ve got your covered. When you’re hitting something with sticks, it’s never going to be dead silent. However, there are a lot of things you can do to make drums quieter (and in many cases, a lot quieter). 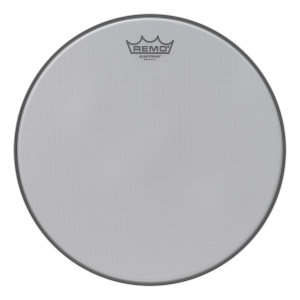 Replacing regular drumheads with mesh heads will dramatically reduce the volume of drums. This is the top solution if you need to make acoustic drums quieter, and one of the the best choices for quietly playing drums in an apartment. There are some great benefits of mesh drumheads compared to a lot of other options that reduce drum volume: Mesh heads feel quite realistic, they can be tuned (tighter or looser, depending on the amount of stick bounce you want), and they are very effective to reduce drum noise. They’ll also give you a small amount of tone if you keep your resonant drumheads on. The only downside with mesh drumheads is they take a little time to install and remove. Remo Silentstroke mesh drumheads are some of the best, and they’re available in all sizes so you can fit out your whole drum kit. Overall, mesh drumheads are the best option for silent drums… They’re about as quiet as it gets on a real drum kit (and they’re actually quieter than the rubber pads on most electronic drum kits). Mesh heads are a life saver for playing drums in an apartment quietly: there’s nothing quieter if you want to play on a real kit. If you go with mesh drumheads, take a look at the low volume cymbal options (further down this page) to accompany them. Tip: you can add triggers to mesh drumheads to turn your acoustic kit into an electronic one! Drum mutes are a quick and easy way to reduce drum volume. They’re soft rubber pads that you place on top of your drumheads, and the benefit here is that you can instantly remove them when you want to play at full volume. Drum mutes are also available for cymbals, and they will dramatically reduce cymbal volume. The downside with drum mutes is that they don’t have the same feel as hitting real drums – there is far less rebound with drum mutes on your kit. On the bright side, this can help you build strength and speed since you’re relying on your muscles and technique rather than stick rebound. Evans SoundOff drum mutes are the best drum mutes available. They’re available in packs to set up your whole kit, or separately. The bass drum mute system is well made (unlike some other brands out there), and the pads themselves are good quality rubber. They do exactly what the name implies: make drums quieter. Overall, drum mutes will reduce the volume of your drum kit by around 70%, which is enough to keep your neighbours happy if you’re in a house. If you’re drumming in an apartment, sound will still travel (especially through the floor or thin walls), so keep this in mind. Zildjian have a great range of low volume cymbals that give a dramatic reduction in noise. You’ll get a cymbal volume reduction of around 80%, compared to regular cymbals. Importantly, these low volume cymbals still feel and respond like real cymbals… They’re much better for practicing with, compared to using drum mutes or towels across your cymbals. If you’re practicing a lot of delicate cymbal work, there’s simply nothing better. Hundreds of tiny holes cause the cymbal volume reduction, while still allowing for a realistic feel. 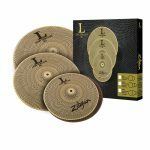 Zildjian L80: These are low volume cymbals for practicing with. Zildjian Gen16: These are the same low volume cymbals, but with an electronic system which gives you real cymbal sounds through headphones or speakers. Zildjian also have a Quiet Pack that includes a full set of L80 low volume cymbals plus a full set of Remo Silentstroke mesh drumheads. These packs are a cost-effective way to silence your whole drum kit in one shot. See our review of Zildjian L80 & Gen16 low volume cymbals here. Changing to thinner drumsticks, or swapping them for rods or brushes, will instantly reduce some of the drum and cymbal volume. The thinner the drumstick, the less force you’ll have, which means lower drum volume. Try a 7A size stick, the Vic Firth AJ5, or the Vic Firth Peter Erskine signature stick – these are all very thin and light. To take your drum volume reduction further, rods are much quieter than drumsticks. There are some great low volume rods like the Steve Smith Tala Wand (the quietest is the Steve Smith TW12). These have a foam center, surrounded by wooden dowels. Rods have a different sound to drumsticks, but they’ll still give good tone and rebound, while reducing drum volume. When it comes to changing sticks to reduce drum volume, the most extreme step is using brushes. Brushes have a different feel to sticks, and barely any rebound, but they’re super quiet. Due to the different feel, brushes require a different technique. When doing rolls, the benefit here is you’ll improve your strength, since you’re relying on your muscles and technique (rather than rebound) when using brushes. The best brushes to get are ones that retract back into the handle. With these, you can play with them fully extended, or semi-retracted (for more rebound). Retractable brushes are also less prone to bending out of shape, since you can store them retracted. Bonus tip: Like your sticks, your bass drum beater has an impact on your drum volume level. If you’re using a hard beater (like plastic, rubber, metal, or wood), you’re going to have a much more cutting and loud bass drum sound. Try a fluffy beater (like this one), which has the smoothest and warmest sound, if you’re trying to reduce bass drum volume. Check out the ultimate bass drum beater guide for more on beaters! As well as changing your equipment, you own movements will directly affect your drum volume. Having good dynamic control is not only useful for keeping the neighbours happy though… It’s something that will dramatically improve your performances and expression. Having good control over how hard or soft you hit each drum and cymbal will make you a better drummer. Your explosive accents will have more impact, and you’ll be able to draw the audience in with quieter moments. You’ll also be able to completely change a beat’s feel by simply playing some limbs louder or quieter than others. 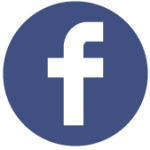 We think dynamics are so important that we wrote an article on it a while ago. Check out our drum dynamics exercises, with enough variations for every drummer, from beginner to advanced. Master these, and you’ll be able to play like a pro at any volume. Here’s JoJo Mayer showing how it’s done! An electronic drum kit is much quieter than an acoustic kit. If you really need to keep the volume down, these are a great option. Roland and Yamaha are the leaders in electronic drum gear game – you can’t go wrong with anything made by these two brands. They have amazing drum sounds, top features, and excellent build quality. Electronic drums have come a long way over the last few decades, and the newer models will probably blow you away. At the cheaper end of the spectrum, you’ll find electronic drum kits with rubber pads. These can still give a moderate amount of noise while drumming on them (imagine a drumstick hitting a hard rubber pad). Avoid these rubber pads if you live in an apartment and need to be very quiet with your drum practicing. The newer Yamaha DTX electronic kits (with white pads) are much quieter than normal rubber, and Roland’s electronic drums with mesh drumheads are also very quiet (pretty much as quiet as it gets, really). Go with one of these options if you’re in an apartment with people above or below you. They’re much better than cheaper rubber electronic drum pads, since the stick-on-rubber sound can travel quite loudly through the floor and walls. If you don’t have a lot to spend, Alesis also have a great budget-friendly electronic kit with all-mesh snare and toms. Check out our article on it here. This kit, combined with some of the other volume reduction tips on we’ve covered on this page, can be a great (and low-cost) way to play drums quietly in an apartment. Roland also have a great cost-effective option with all-mesh snare and toms – read our full review of Roland’s TD-1DMK here! Put thick foam floor tiles under your kit (like these). This will dramatically reduce drum noise travelling through the floor. Use thinner sticks to reduce the stick noise on your electronic drum kit’s pads. 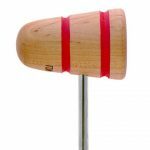 Your bass drum is probably causing a lot of noise – get a fluffy bass drum beater (like this one), or tape a thick towel around your bass drum pad. It should still trigger with the towel, but a lot of noise will disappear. Check out this Yamaha silent kick pedal (with no beater) – this is about as quiet as it gets for an electronic bass drum pedal. It will keep your neighbours happy, especially if you’re drumming in an apartment. Roland has the Noise Eaters range – these are sound isolation feet and mats to place under your stands and pedals. These are effective to reduce drum noise travelling through the floor, similar to thick foam floor tiles. If you use any regular drum stands with your kit (e.g. a hi-hat stand), place the feet as wide apart as possible. This will reduce the amount of sound shooting directly down into the floor. Work on your drum kit dynamic control so you’re not pounding the kick drum, hi-hat, or the rest of the kit. Put towels across your drums and cymbals. This are basically DIY drum mutes, and they’re effective at reducing drum noise. The thicker the towel, the more you’ll reduce drum volume, however you’ll also loose a lot of rebound. Stuff your bass drum with a thick blanket, towels, etc. The more you put in there (and the thicker it is), the more you’ll reduce bass drum volume. Put sheets under your drumheads, between the bearing edge and the head: Remove your drumheads, cut up an old bedsheet, and stretch pieces of the sheet across the drum as you put the drumhead back on. This will help to lower the volume of your drum kit. Remove your resonant drumheads – this will reduce your drum volume somewhat. If you do this long-term, it’s safer to put the hoops back on (to protect your bearing edges): Get some old drumheads and cut huge holes in them (leave 1-2 inches around the outside), then put these on as resonant drumheads. This will ensure your bearing edges stay protected. Put upside-down drumheads on your drums: Get some old drumheads and lay them on your drums, upside-down. This will moderately reduce your drum volume. The more you put on (or inside) your drums, and the thicker it is, the more you’ll lower your drum kit’s volume. Combine some of the above drum volume reduction tips for a greater effect! For a huge list of other dampening methods, check out our huge drum dampening guide. Many of these tips can help you reduce your drum volume. If you can’t afford an electronic drum kit, you can buy practice pad kits which allow you to quietly work on your chops at home. While they doesn’t give you anything close to a realistic drum sound, they are a LOT quieter than a real drum kit. You’ll be able to improve your technique and coordination without annoying the neighbours. These are a big step up from using a single practice pad, because you can work on your movements around the kit and your limb independence. The DW Go Anywhere Practice Pad Kit is one of the best out there – it has a small footprint, and includes an attachment for a bass drum pedal (it will even fit a double bass pedal). The DW kit is also expandable with extra pads, so you can build a practice setup that reflects your actual drum kit. Importantly, the pads are quiet, and they feel fairly natural when played with sticks or rods. it folds away easily to save space, and everything is adjustable so you can set it up how you like. Some other models out there are a little clunky or noisy, and the DW Go Anywhere Practice Pad Kit is one of the best we’ve come across. Sometimes a little conversation can go a long way. Most people are reasonable – especially if you get a chance to explain your perspective to them, and especially if they feel like you understand their perspective. This tip works best before you get noise complaints, so take the initiative to do this before you play for the first time in a new place. Go and chat with your neighbours, and explain how passionate you are about drumming. Make sure you mention that you’re aware it’s noisy, and that you’re there to find a practice time that works best for both of you. It’s very likely that they leave their apartment to go to work, or have regular appointments throughout the week (sports, family, grocery shopping, etc). These times are perfect for you to play, because your neighbours aren’t home to be disturbed. Give them your phone number in case they sometimes need to arrange a different playing schedule… They’ll be much more tolerant if they know they have some control over the situation. And, most importantly, bring them some beer, chocolates, or flowers to say thanks. Stay on their good side! Good soundproofing is very expensive, especially if you want to stop all drum sound getting out. Don’t use egg cartons, they’re useless! The ultimate drum soundproofing solution is to build a room within a room, however this isn’t feasible for most people. On a cheaper level, there are a few things you can do to reduce the amount of drum sound travelling out of the room. Couches, thick curtains, and carpet will all absorb some sound. Think about setting up your kit in a room with a lot of these things. Windows will leak sound more than walls. If you’re lucky enough to have a basement, this is a great space to play in. 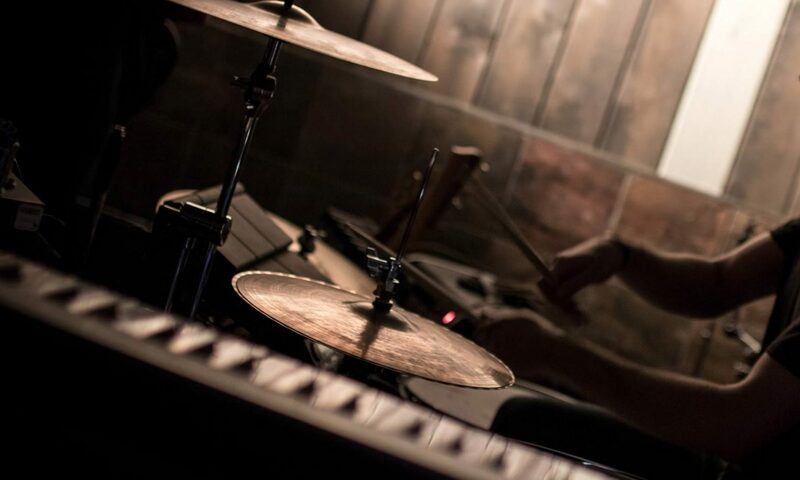 The worst thing you can do is play in an empty tin shed with hard floors… If this is your drumming space, think about covering the floor and walls with scrap carpet or any other thick material. This won’t solve your drum noise problem, but it might make things more bearable for everyone nearby. Combined with some of the other tips on this page, you might have enough drum noise reduction to play comfortably. The drum volume reduction tips on this page will help you cut out a lot of drum noise. However, a lot of them won’t work for extreme cases (like playing drums in a small apartment). The best thing you can do if you really need to reduce drum volume is to use mesh drumheads and low volume cymbals, or get an electronic drum kit. When playing drums in an apartment, there’s really no other way to do it quietly. Even with these solutions, sound might still travel – especially through the floor, and especially from the bass drum pedal. Put down some thick foam floor tiles (like these), and go easy on the bass drum. It can really help to double-up the foam floor tiles, sometimes one layer isn’t enough. A lot of people can comfortably play drums an apartment quietly, so don’t be discouraged! It might just take a little work to get set up with the right gear. Make sure you chat with your neighbours too – find a regular time when they’re out (at work, shopping, etc) so you can play without disturbing them. Okay, so this is worst-case-scenario stuff. You want to play drums in a tiny apartment, with paper-thin walls, and you’ve got neighbours that won’t tolerate anything louder than complete silence. You can make drums quieter with the tips on this page, really quiet, but never completely silent. Unfortunately, you might just have to play elsewhere. Check the laws and regulations regarding noise in your neighbourhood, but you’re probably going to find they’re not on your side (especially in an apartment). There are rehearsal spaces you can rent in most cities, either by the hour or by the month. Many will come with a drum kit you can use, otherwise you can bring your own (although setup time can eat into your playing time). If you don’t know of any rehearsal spaces, ask other musicians or check your local craigslist/kijiji/gumtree/etc. It’s quite common for a bunch of different people to share a rehearsal studio and pay monthly, and there are a lot of drummers out there who practice this way. The bonus here is that you can invite friends to jam with, and you will get a space to store your gear. To keep up your skills at home, get yourself a quiet mesh practice pad, or practice on a pillow. The best mesh practice pad out there is the Sabian Quiet Tone practice pad… It’s spacious, quiet, and it can be tuned to change the amount of rebound. For intermediate and advanced drummers, the Moongel Practice Pad is the absolute quietest drum practice pad out there. It’s not recommended for beginners, because the pad is extremely soft and can be difficult to use if you haven’t built good technique. The pad’s soft gel surface absorbs each drumstick hit, which dulls the sound (and is designed to build up muscle strength). When you’re practicing at home, you can still use your other limbs – keep time with your left foot, and mime a bass drum on your right one. If your practice pad is on a stand, spread the stand’s legs as far apart as possible (and use foam tiles underneath), to stop sound travelling down through the floor. The Roland RMP Rhythm Coach is a much more advanced practice drum pad, and great for quietly practicing drums in an apartment. 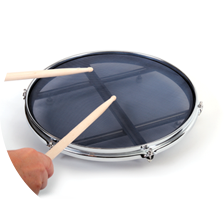 This is a mesh electronic drum pad, with a built-in drum module. Importantly, the Roland RMP is designed to help you improve your skills with its advanced metronome, rhythm coaching, and time-checking features. There are a range of built-in drum sounds, and the option to add bass drum and cymbal pads for a more realistic mini electronic drum kit. Final Tip: Are you bored playing on a single pad or a really minimal setup? Get yourself a cool little music gift: a sequencer to program some drum beats. These can help you come up with really interesting grooves and patterns, and they’re much more fun to play along to compared to a metronome. 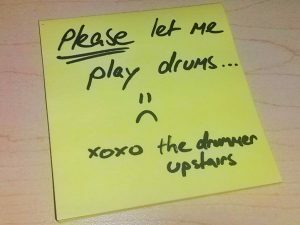 If you’re stuck in an apartment with paper-thin walls, they’ll help keep your creativity flowing when you can’t play a real kit. Got Any Other Tips To Reduce Drum Volume? Get in touch! If you’ve got something else worthy of being on this list, we want to hear about it. Tell us your best drum volume reduction tips and tricks… We want to know how you make drums quieter. For more on reducing your drum volume, check out our huge drum dampening and drum muffling guide, and our overview on the best drum pads. We’ve also got a range of sound control products that can be helpful to lower your drum volume. Want even more? Check out our free articles on the best bass drum pedal at different price ranges, everything you need to know about bass drum port holes and resonant snare drumheads, or our roundup of the best drum accessories and gifts for drummers.